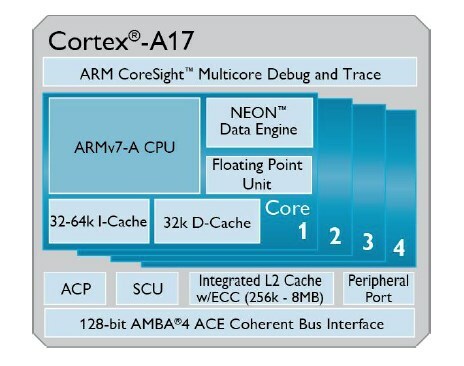 ARM presents the Cortex-A17, a new chip design that focuses on mid-range smartphone and tablets. To be made on a 28nm process, the Cortex-A17 features big.LITTLE and promises a 60 percent performance boost over the Cortex-A9. It's paired with the Mali-T720 GPU with OpenGL ES 3.0 support and features plenty of optimizations for low-end Android devices. Exact details on availability weren't revealed but you'll likely have to wait until 2015 to see a big push of devices with the A17.